Work more efficiently with the best specialty power tools and high quality hand tools for timber framing, boat building, carpentry and log building. Canadian customers: If you would prefer to be billed in Canadian Dollars, we would be happy to take your order over the phone and bill you at the current exchange rate. Please call us toll-free: 1-800-350-8176. Staff really know their tools! We keep your power tools working at their best — even our competitors' brands! One-Stop Shop for Timber Framers' and Log Builders' tools. Find a SwissPRO or HEMA Chain Mortiser, Chain Slotter , hand-held Portable Band Saw or Chain Beam Saw - Essential power tools with European engineering for your carpentry or timber frame construction projects. Hand forged chisels, slicks, flarens and other wood cutting tools with incredible edge holding capability from our own BUFFALO TOOL FORGE have been enthusiastically embraced by our customers. We are aiming to forge about 1000 new tools this year. The remarkable Belgian Blue and Ardennes Coticule whetstones will keep your tools sharpened to a fine edge. SERRA portable sawmills - not your average portable sawmills, these are amazingly productive machines! Krusi CNC machines from Switzerland to match the growth of your business, for specialty applications, structures or timber frames. Land Ark Wood Finishes - an old tyme, all natural wood finish. Spray on, brush on or rub in by hand to reduce undue checking of green timber. 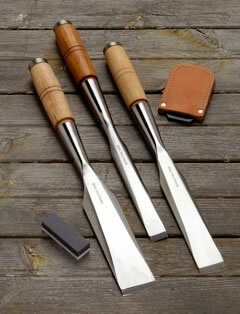 Belgian whetstones - superb sharpening stones used and treasured since the days of the Romans. Whether you're a log builder, timber framer, boat builder or carpenter, our power tools, hand tools and services will make your job easier and more efficient. If you find more knowledgeable service or lower prices elsewhere on any quoted item, let us know! "I just received my order from you for two (Doublecut) auger bits, a ¾" x 12" and a 1¼" x 12". The delivery was exceptionally fast which I appreciate very much. 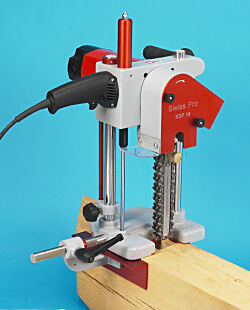 I have just drilled holes with them and can not believe how wonderful they work. 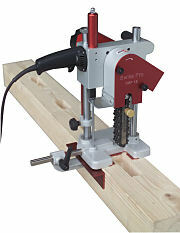 Easy and fast as well as perfect smooth holes in the hardwood. These are the best that I have ever used. Thank you for the fast service and the excellent product. I will recommend you to all of my associates and friends." Much more than a glorified Forstner-style bit. This template system makes cutting dovetail mortises and tenons with a router quick and easy, as if you had a CNC machine, but much cheaper. We are extremely impressed with the intelligent design, quality and safety features of this system. the world's best timber auger. Double-cut features both the cleanest drillhole and two tough-wearing edges. Recently one of our customers drilled 6000 holes with two 1-1/16" 18" bits, before replacing them! Available in 18" and 24" lengths, also various extensions up to 24" in length are available. NEW, now available: 12" length! Even if you paid more, you wouldn't get a better mortiser! Rugged and ergonomic, designed for the North American timber framer and made in Switzerland! And its smaller cousin, the Swiss KSL-161 chain mortiser.